This is the main place in FrontAccounting where you can manage your customer data. edit existing Supplier - select a supplier from drop down list, modify data and click Update Supplier on the bottom. Supplier Short Name - a unique supplier id in the system. Payment Terms - select an item from Payment Terms. This represents default payment terms in Purchase Invoices. 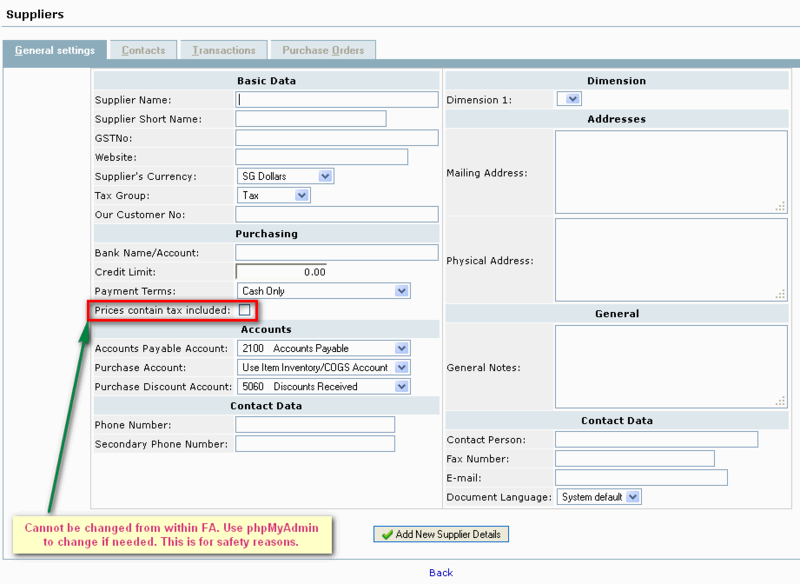 Accounts Payable Account - default account can be setup in System and General GL Setup. Contact Data - based on those fields a default company contact is set. Further contacts can added in Contacts tab. EVERY reports will send an email to everybody from the current and the main company will match those criteria except for statement and receipts. Example the invoice report will send an email to (if existing) - branch.invoice - branch.general - customer.invoice - customer.general. For statement and receipt only the first person (in that order) will receive the email. So, a contact set as general on the customer settings, will receive every emails except from statement and receipt (except if nobody else get this email). To summarize, general mean all and customers receive email for every branch. If you have many records you can enable Search Supplier List in Company setup. You can then start a search by pressing a space in the Supplier list, or use the edit box in front of the list if such one is available. Now enter fragment of Supplier name and press tab. The list will now be populated with relevant records. If you enter a *, all records will be shown. When you create a supplier a General contact data for supplier contact type is created based on data entered in the data entry form. It is not possible to delete a supplier entry after at least 1 document has been entered. This is still valid even the document was deleted. In this case use Supplier status = Inactive. For safety reasons, this field cannot be changed from within FrontAccounting. Use a MySQL client like phpMyAdmin to change it.